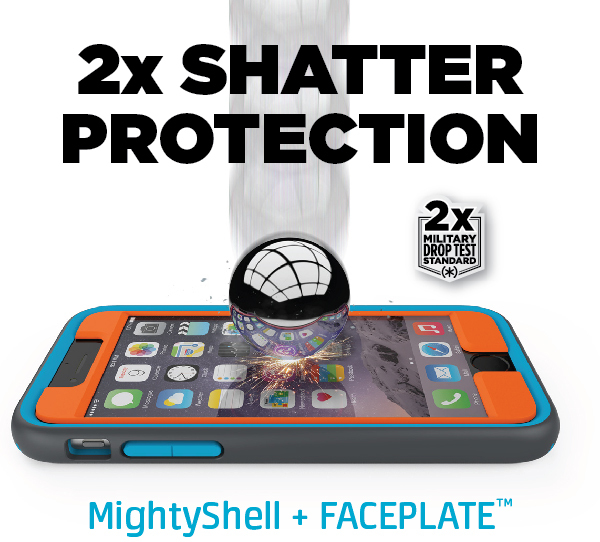 How does the new Faceplate on MightyShell + Faceplate provide 2x shatter protection? Our new Faceplate features a 5-layer technology that gives your screen double the shatter protection than it would have without any coverage. Learn more on the MightyShell + Faceplate product page for iPhone 6. Will the Faceplate affect my iPhone screen’s natural responsiveness? We feature a special TrueTap™ technology on our Faceplate that bonds directly to your iPhone for a completely natural touch response. That’s right – Our new, tougher Faceplate offers even more protection without compromising the screen’s sensitivity. You can text and tap away with confidence! How do I install the Faceplate? You can follow our installation and cleaning Instructional Video here, or learn more on our Instructions webpage here. Can I clean the sticky part of the Faceplate? How should I get bubbles out from under the screen? To remove dust particles on the Faceplate, use either the cleaning sticker as shown in our Installation and Removal video, or use scotch tape as a replacement for this sticker. Simply wrap the scotch tape around two fingers and dab it on the Faceplate to remove any debris. After re-applying the Faceplate, it may take 24-48 hours for any bubbles to settle out. Can I remove the Faceplate and use it again later? While you can remove your Faceplate to clean it from dust or to remove bubbles, we do not recommend leaving it off of your phone for an extended period of as it may lose some of its adhesiveness. Can I use the Faceplate with a different case than the one it came with? We do not recommend using your Faceplate with a different case than the one it was intended for. If this Faceplate is not used with the corresponding MightyShell, the bezel and edges may not align properly and you will not achieve the 2x shatter protection standard that MightyShell + Faceplate is designed to deliver. To see exactly how much more protective our Faceplate is, click here or watch below. What is the difference between MightyShell + Faceplate and CandyShell + Faceplate? The biggest difference between MightyShell + Faceplate and CandyShell + Faceplate are the cases that come with either. Our MightyShell is a triple-layered, 2x military-grade protective, slim case with a matte finish. Our CandyShell is a dual-layer, military-grade protective, super slim case with a glossy finish. *The 2x shatter protection technology in CandyShell + Faceplate is only available for iPhone 6 and iPhone 6 Plus. Our previous versions of CandyShell + Faceplate for iPhone 5/5s, iPhone 5c, Samsung Galaxy S4, and Samsung Galaxy S5 do not have the five-layer technology that our new Faceplate contains. How is MightyShell so much more protective than other cases? First, its inner walls are lined with our patent pending Radial Impact Geometry, which lets the case compress on impact in order to disperse shock and protect the phone when dropped. Second, the perimeter bumper features an added layer of TPU to give you extra grip and three layers of protection. Third, the bezel on the perimeter rises 2mm (.08″) above the iPhone’s ion-strengthened, curved glass for extra screen safety. For more information on MightyShell, you can visit our MightyShell FAQ page.